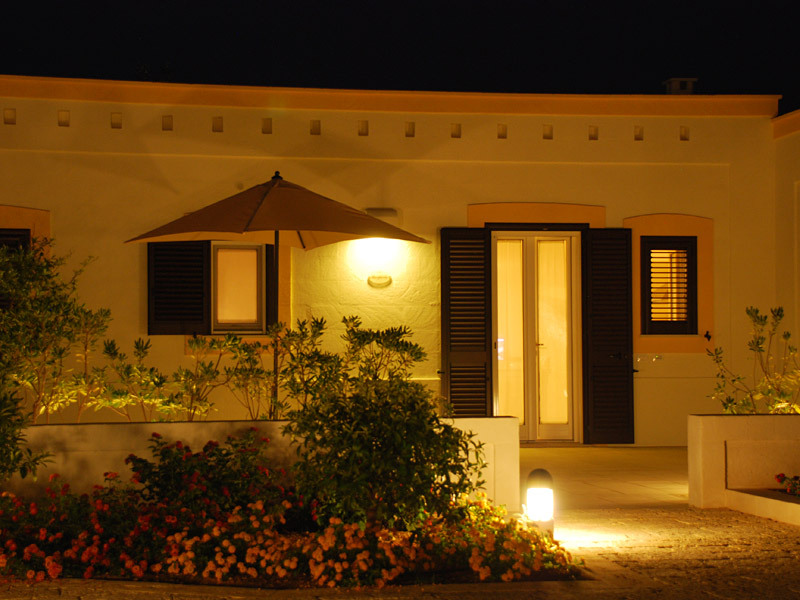 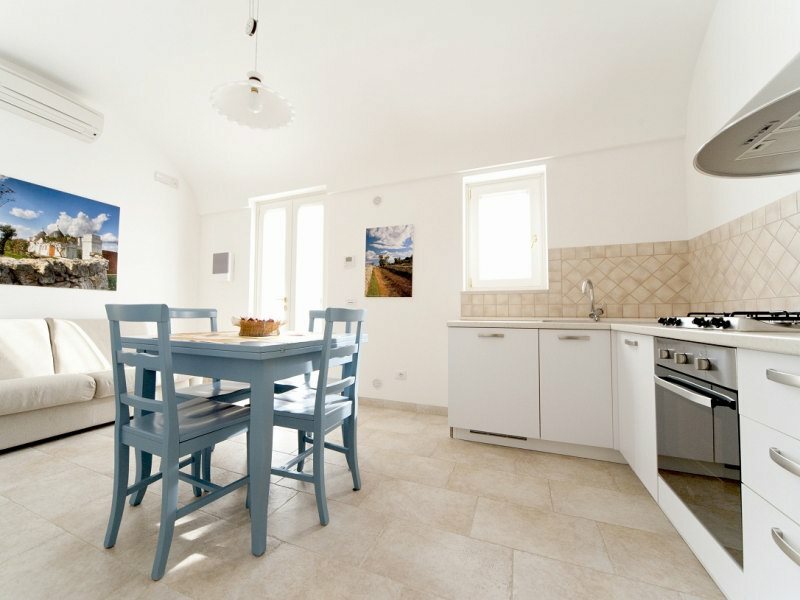 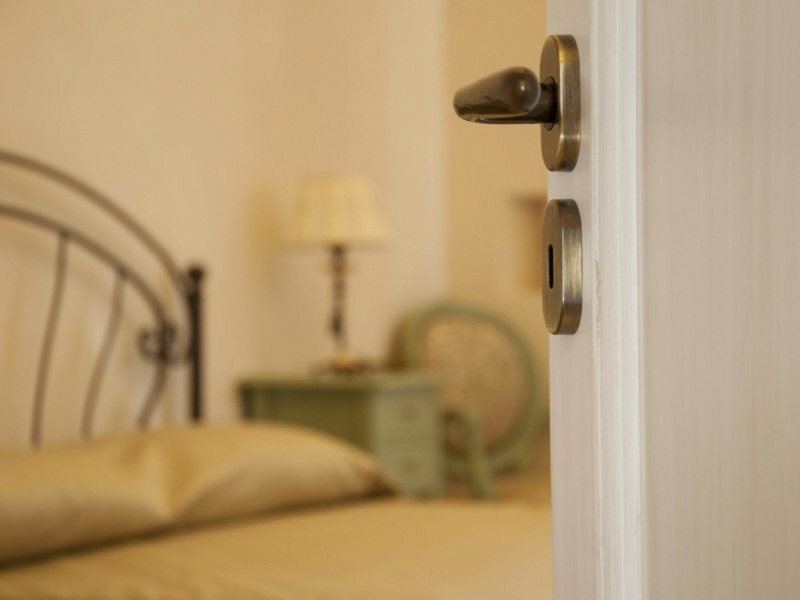 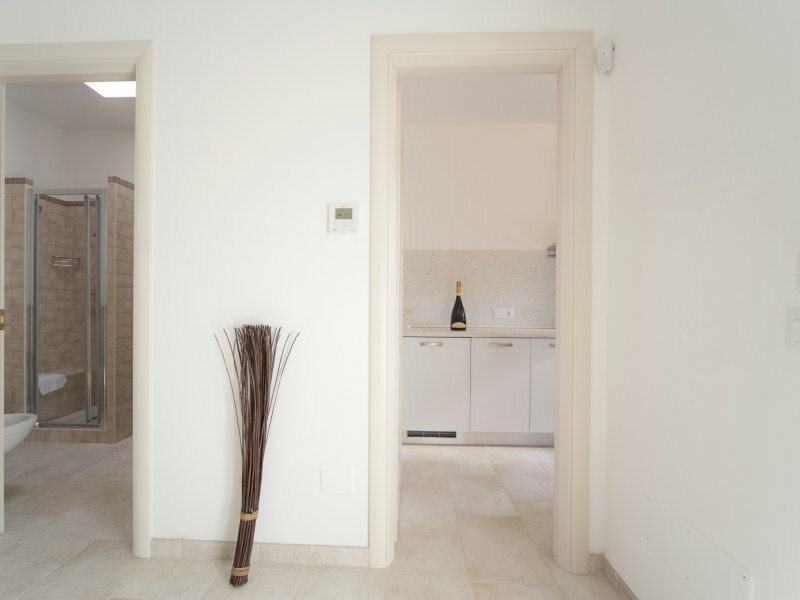 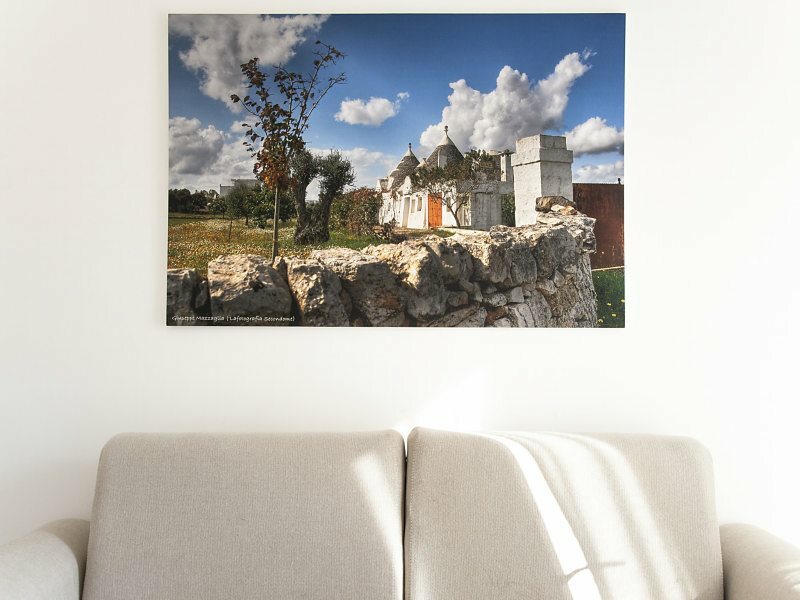 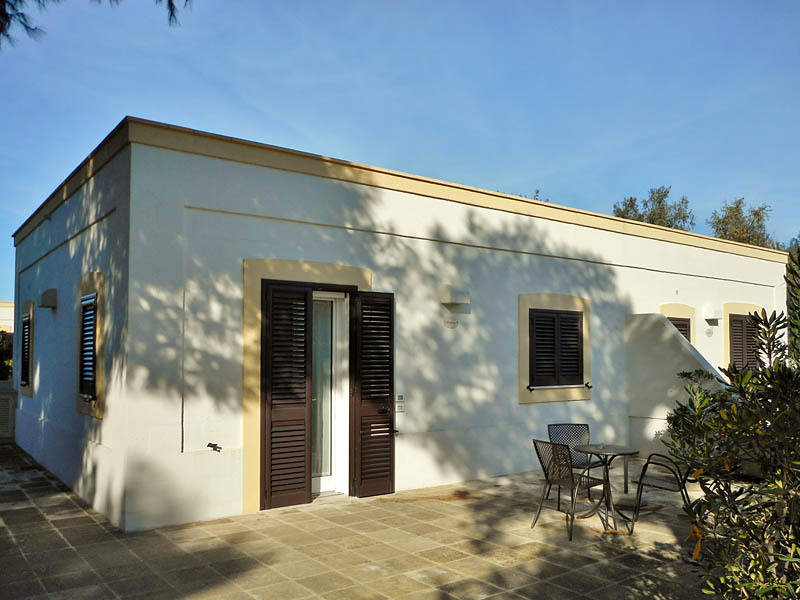 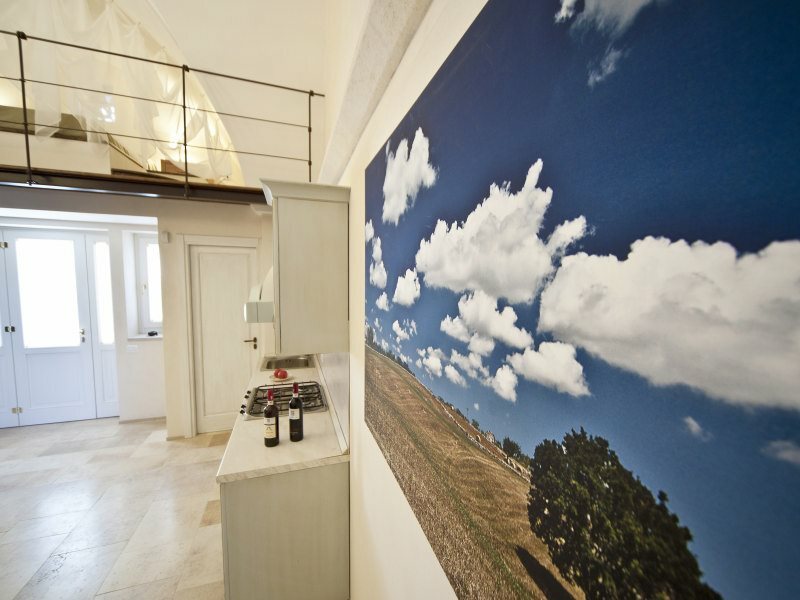 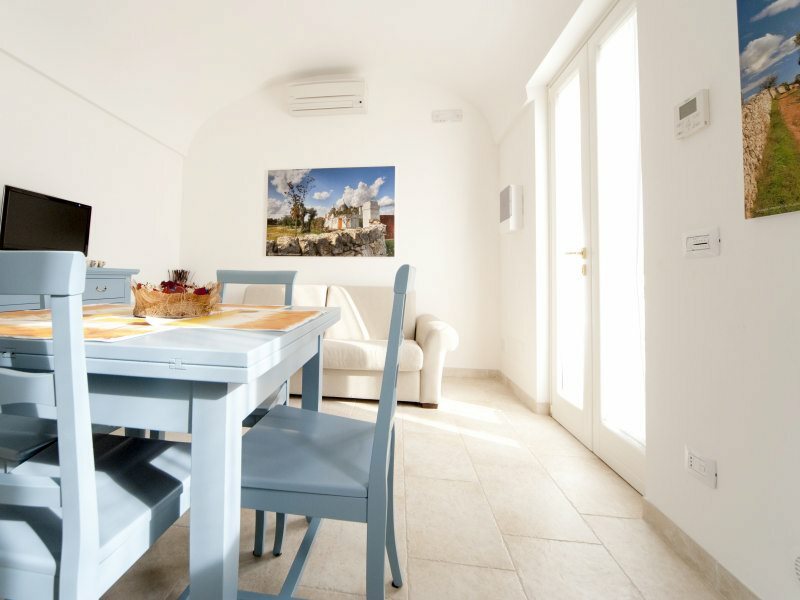 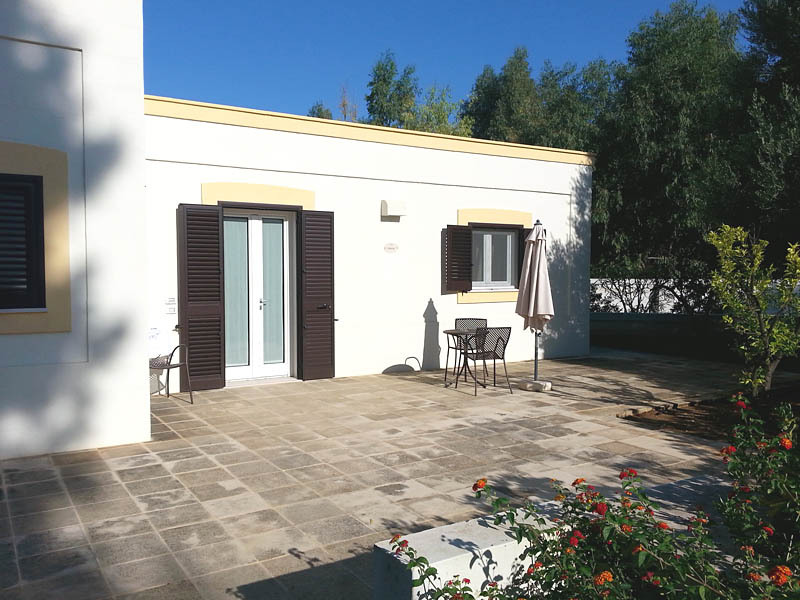 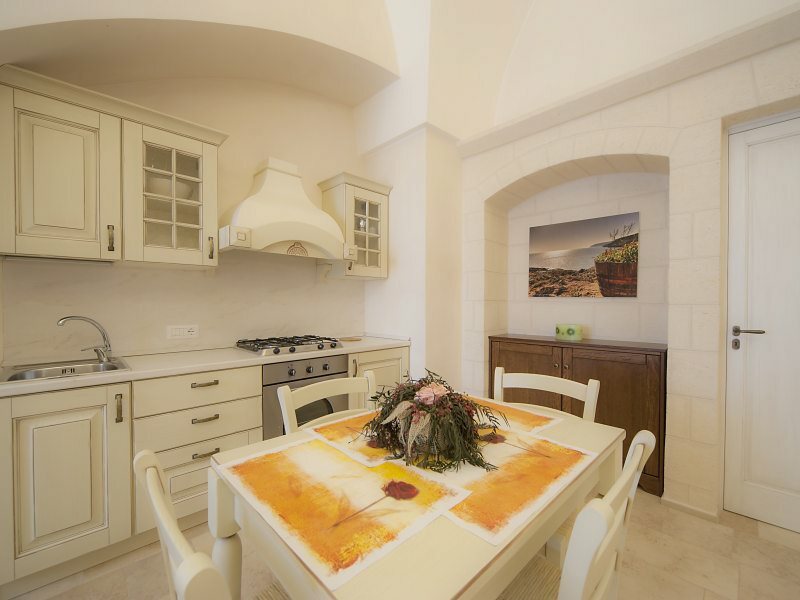 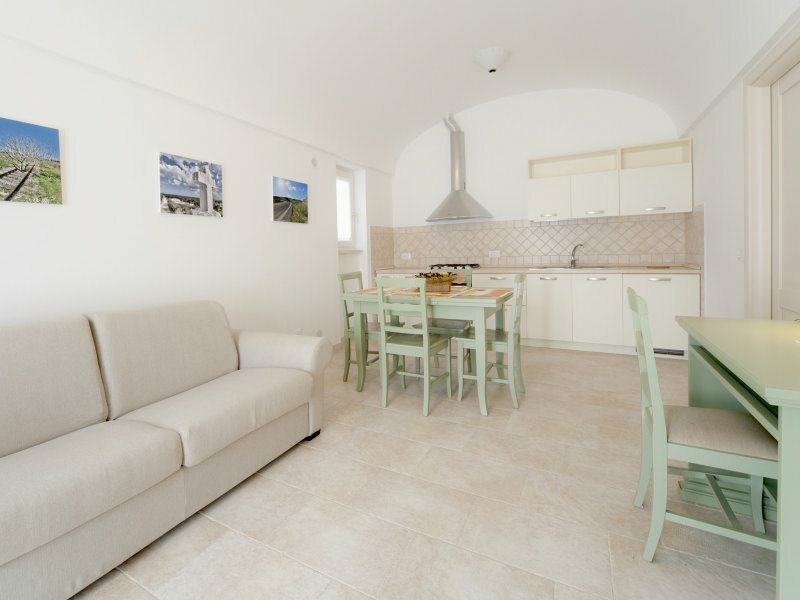 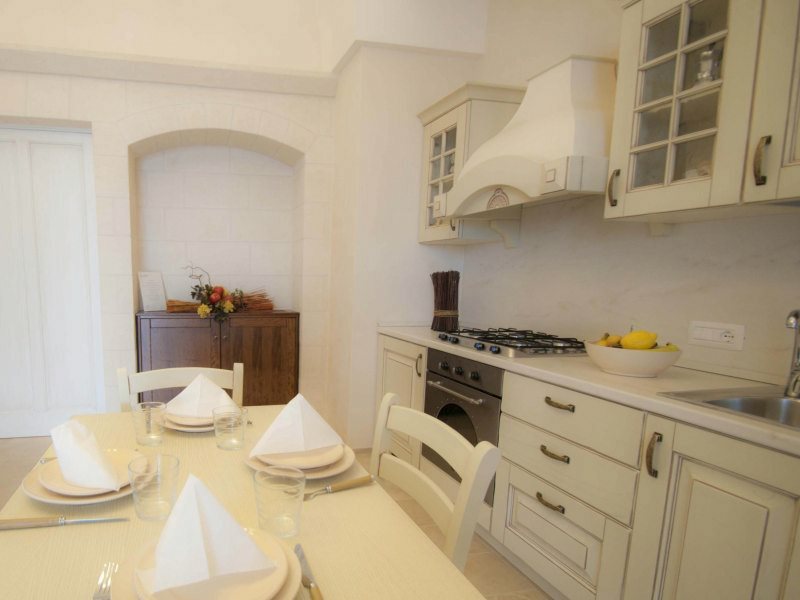 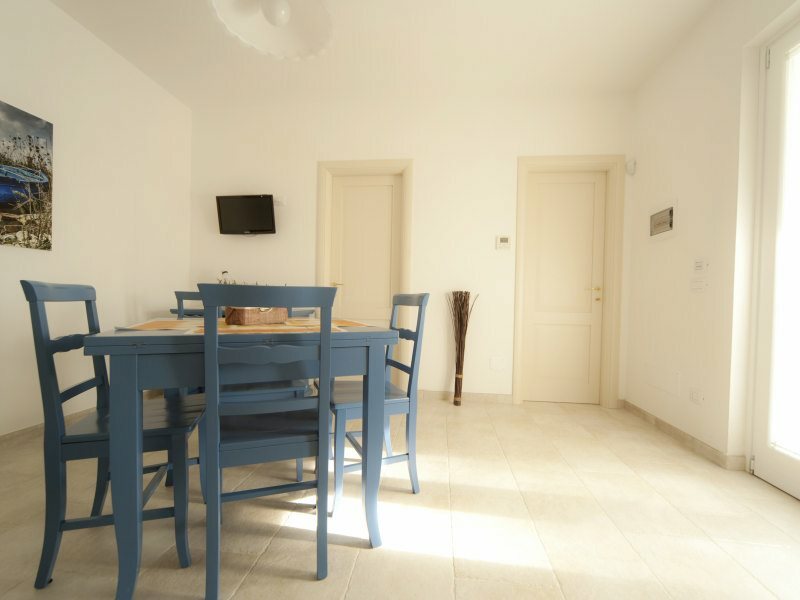 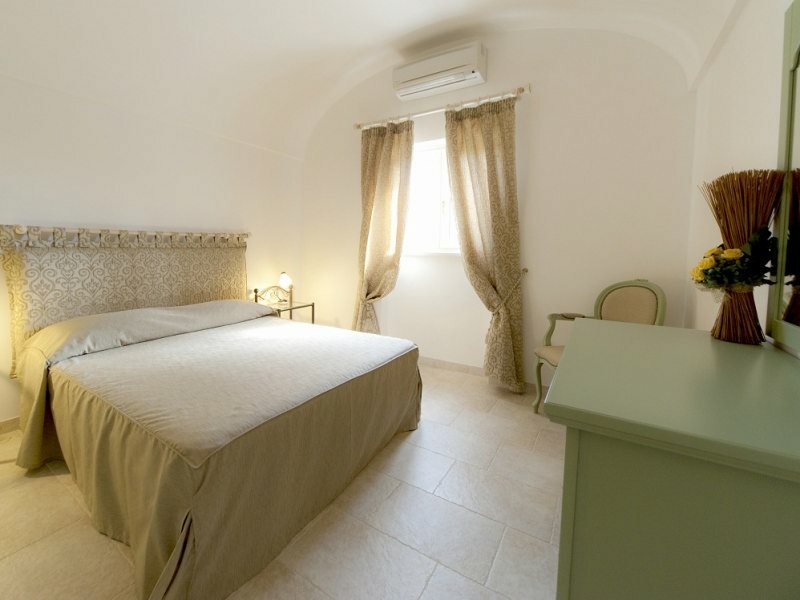 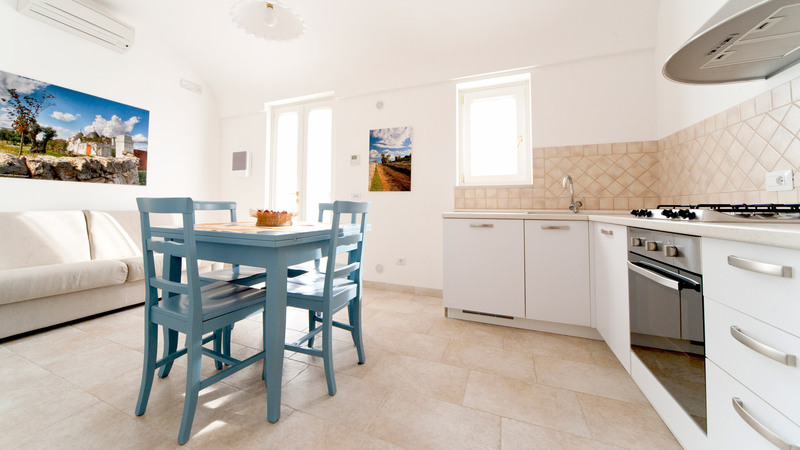 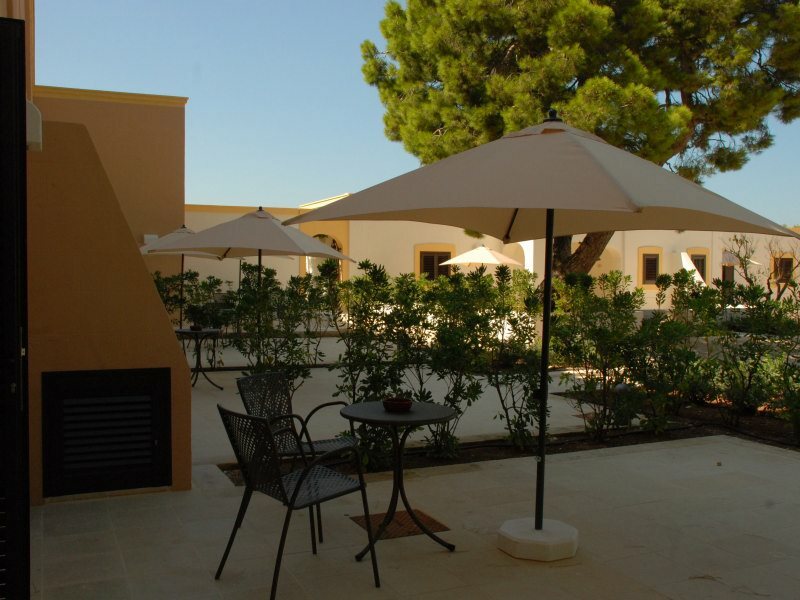 The Masseria San Velletri Guest House has five comfortable apartments and four suites, which are characterized by a pleasant atmosphere that enhances the contrast between the old and modern style. 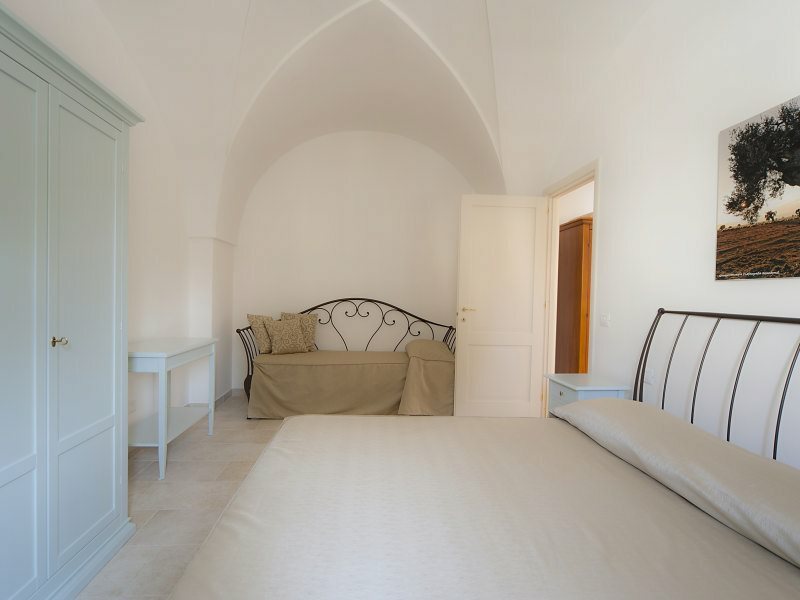 The typical vaulted and elegant furnishings make them unique and comfortable. 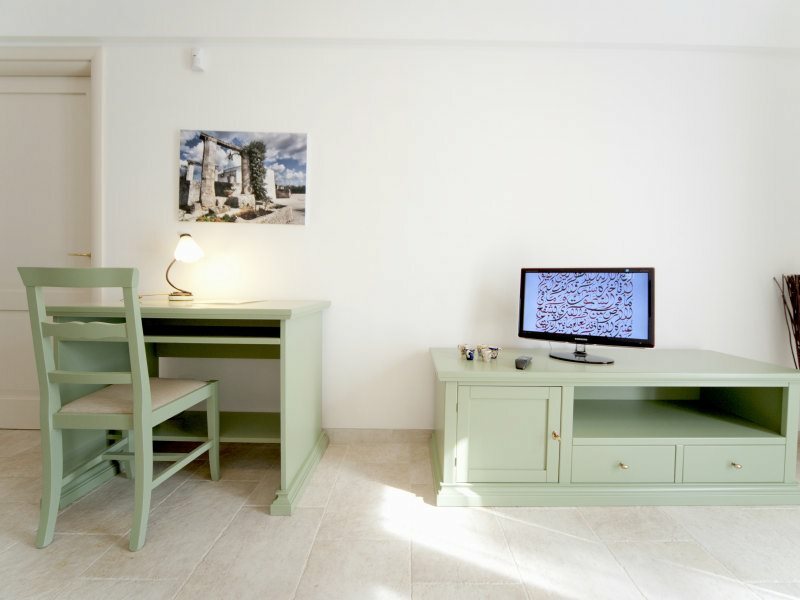 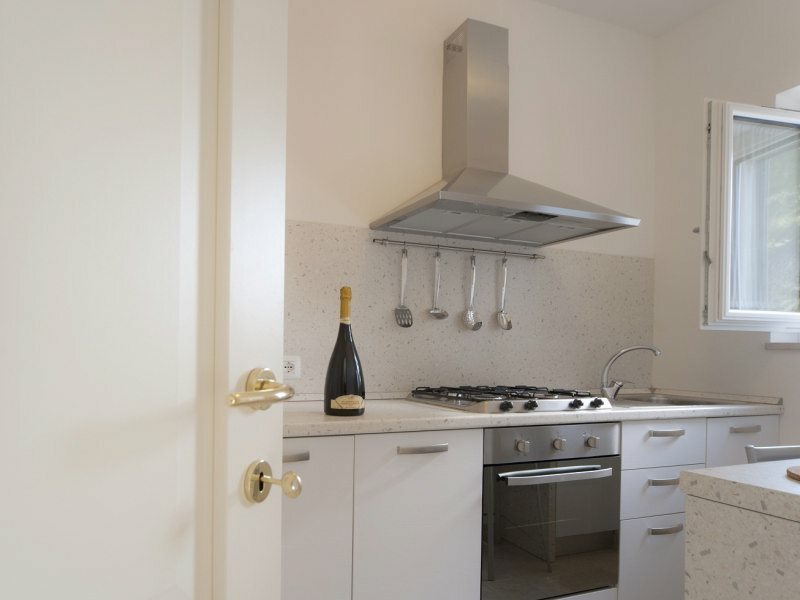 All rooms have: private square in front, fully-equipped kitchen or kitchenette (excluding the Suite Cedro), minibar, bathrooms with shower with seat stone, hair dryer, heated towel rails, air conditioning / heating, LCD TV, WiFi. 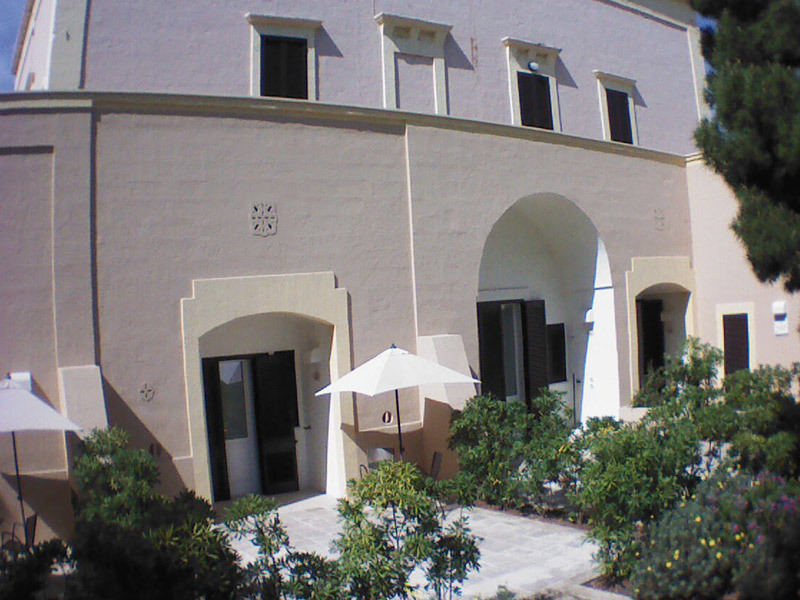 Outside the green environment will allow guests to enjoy the pleasan tscents and colors of the old or chard and flower beds that surround the elegant line of the infinity pool. 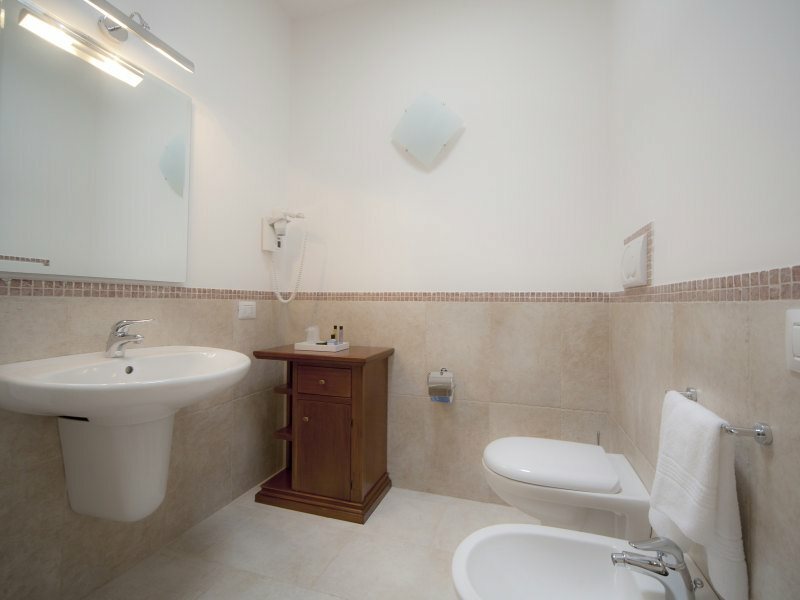 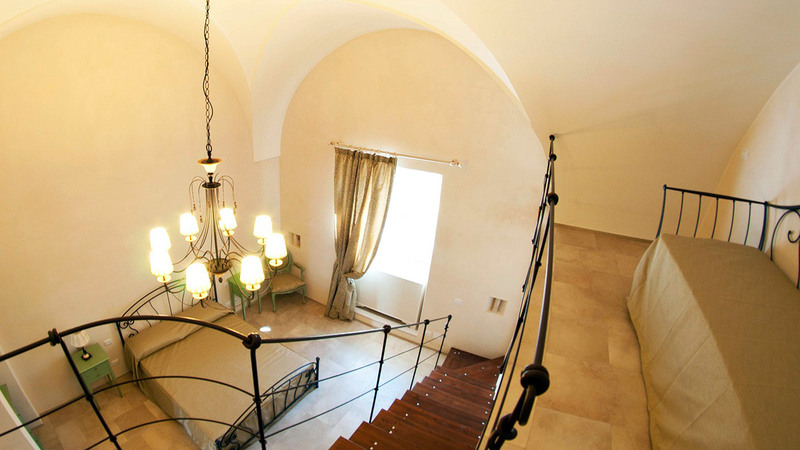 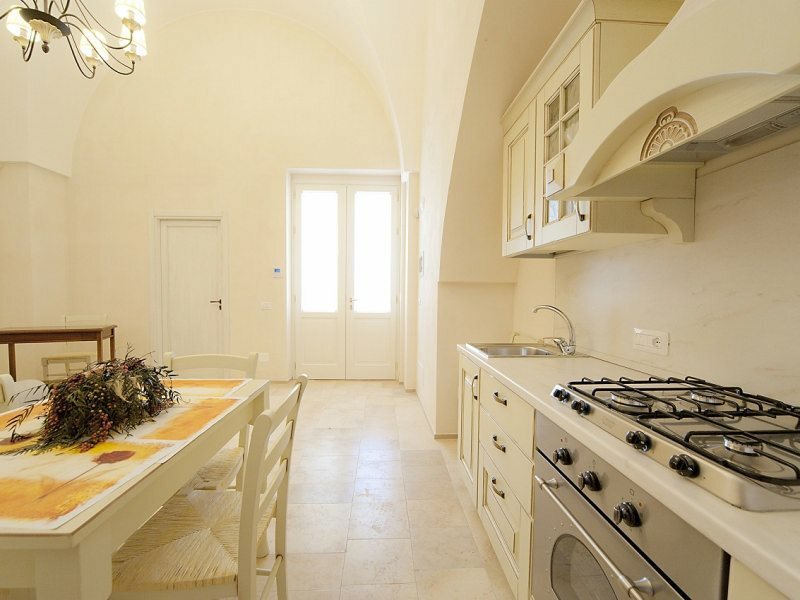 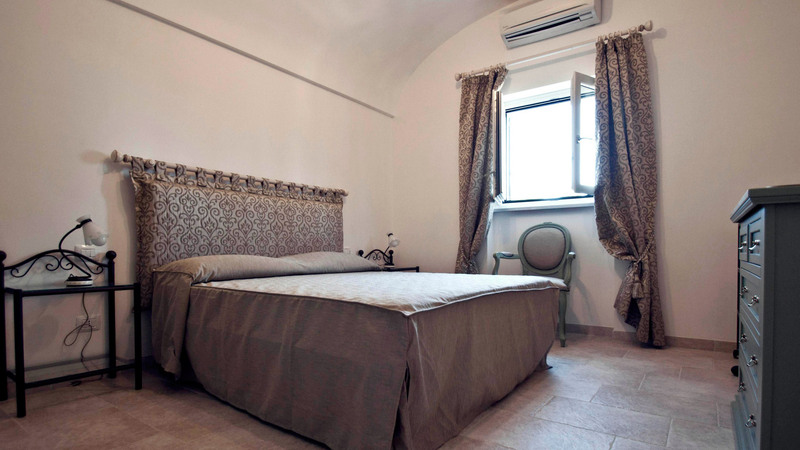 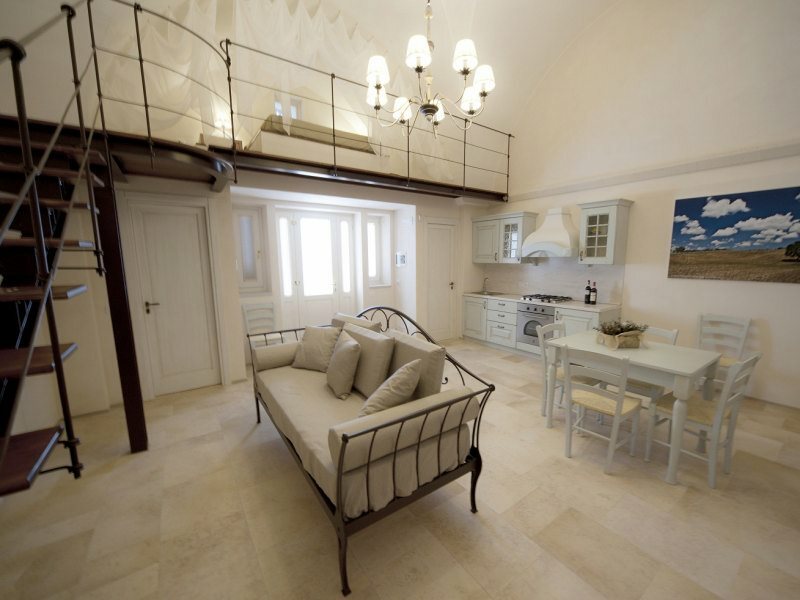 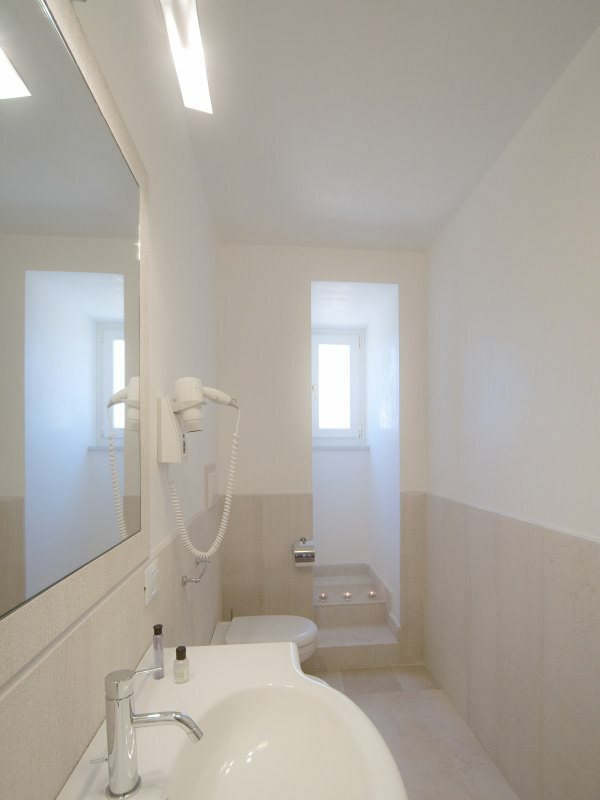 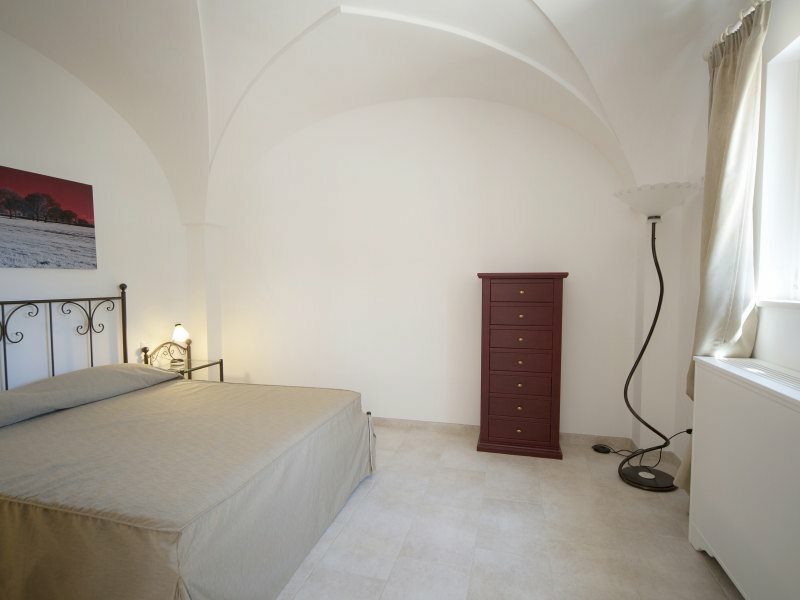 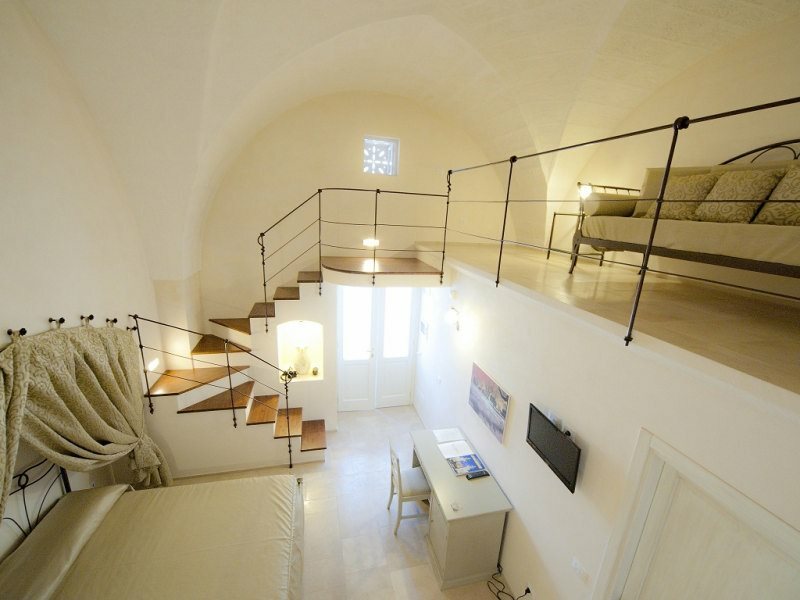 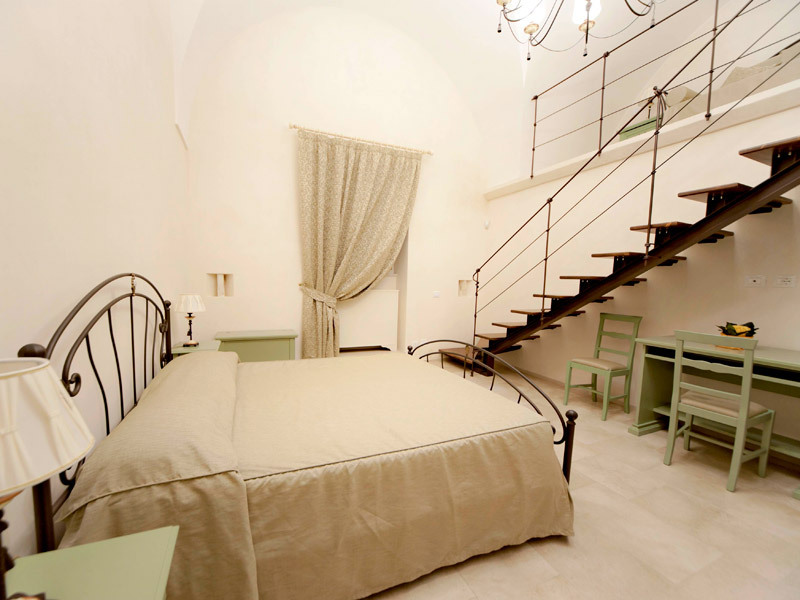 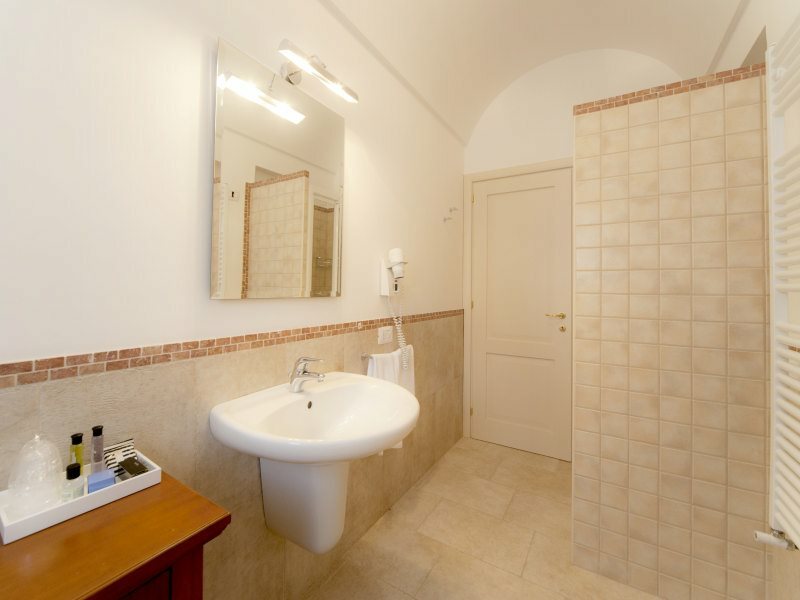 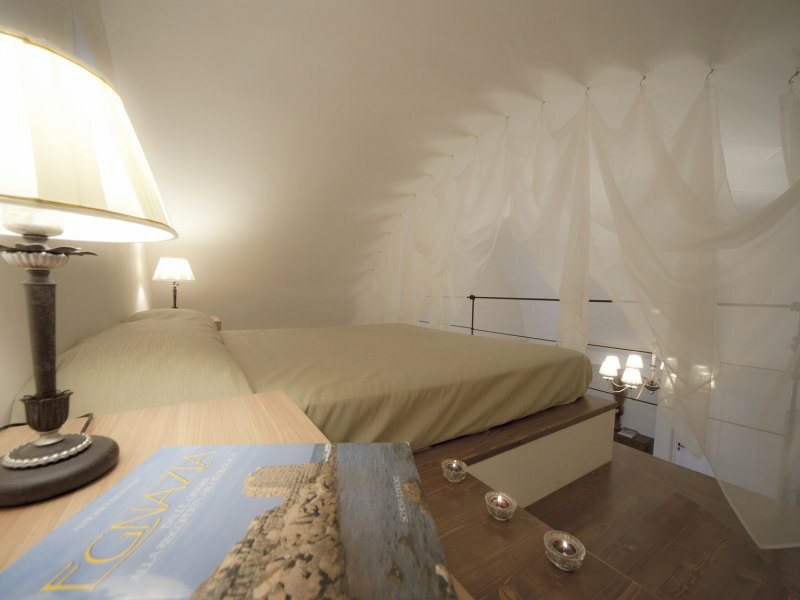 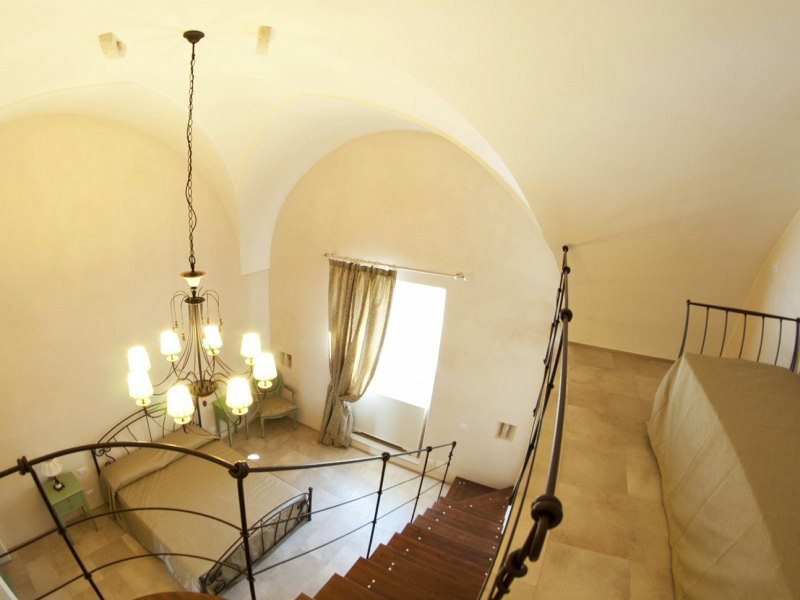 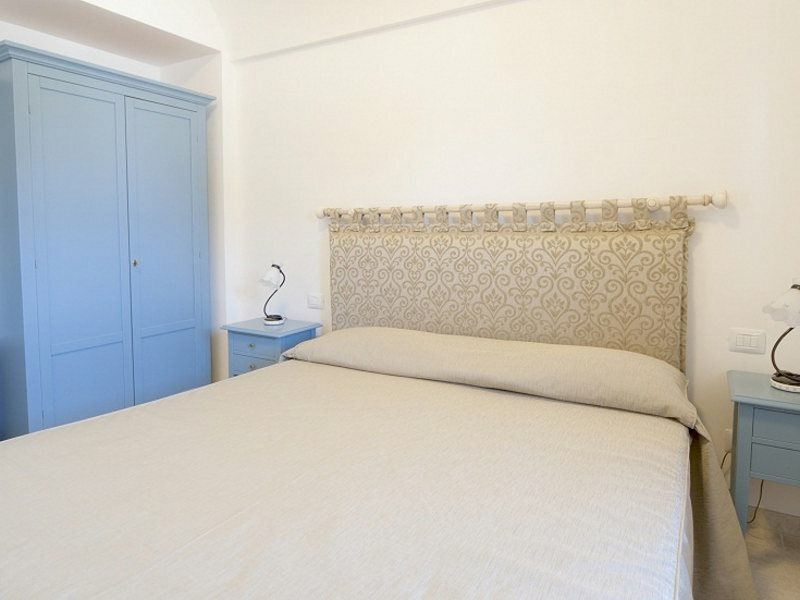 This is an elegant triple room obtained in the body of the old farmhouse. 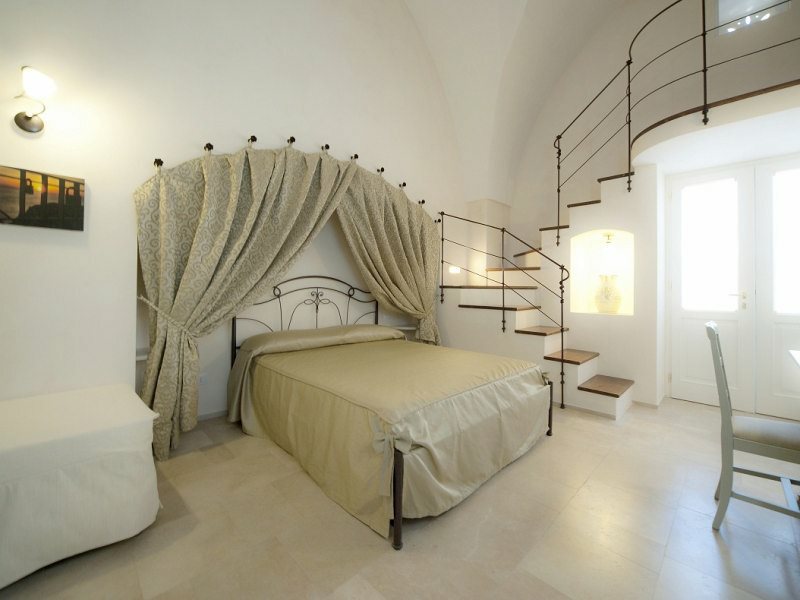 Consists of a double bed with a refined drape above, loft with single bed and a pouf that becomes a single bed. 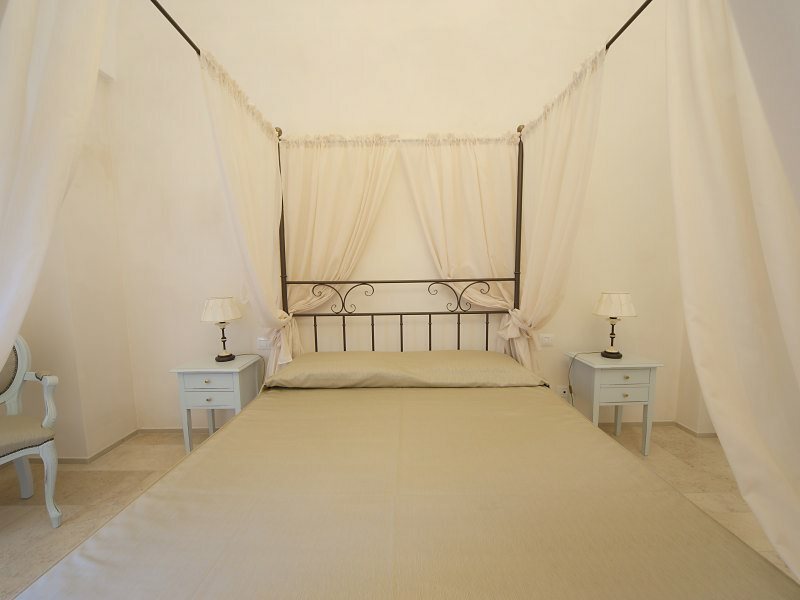 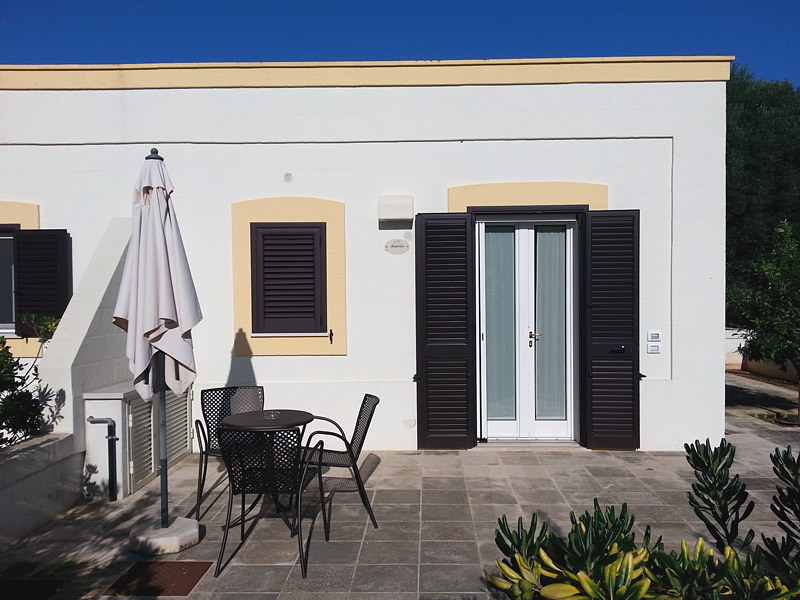 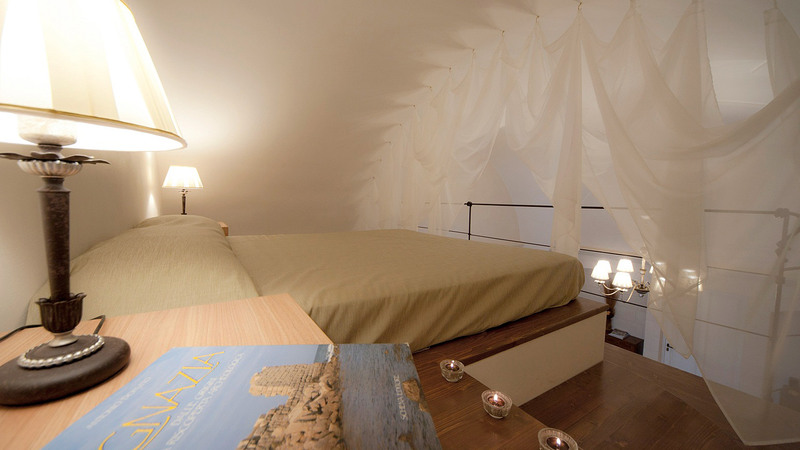 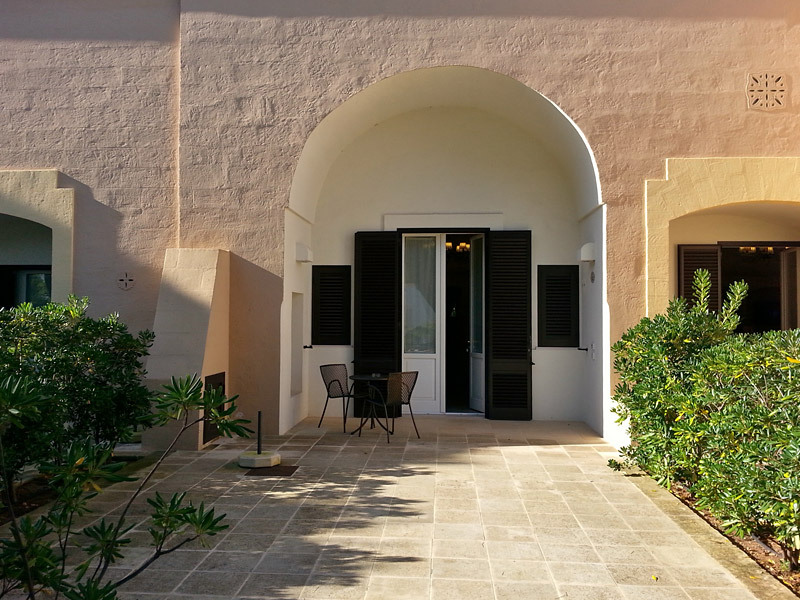 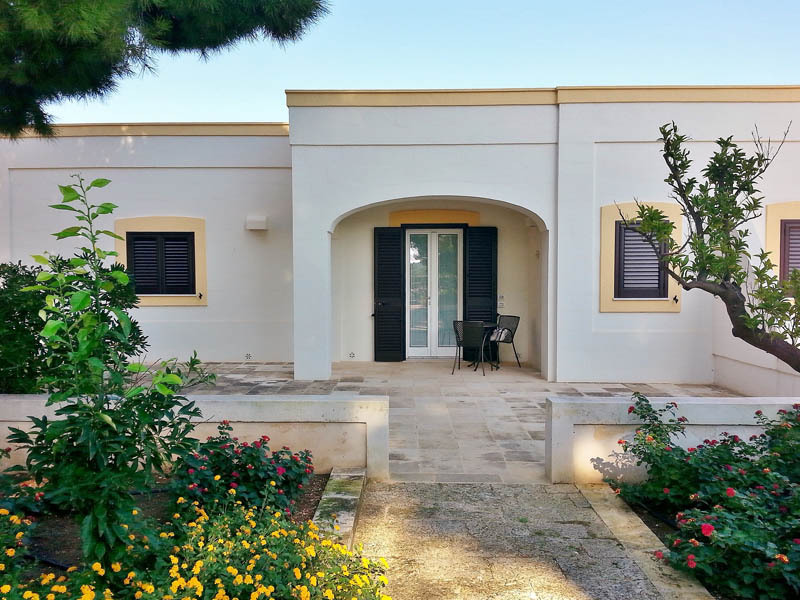 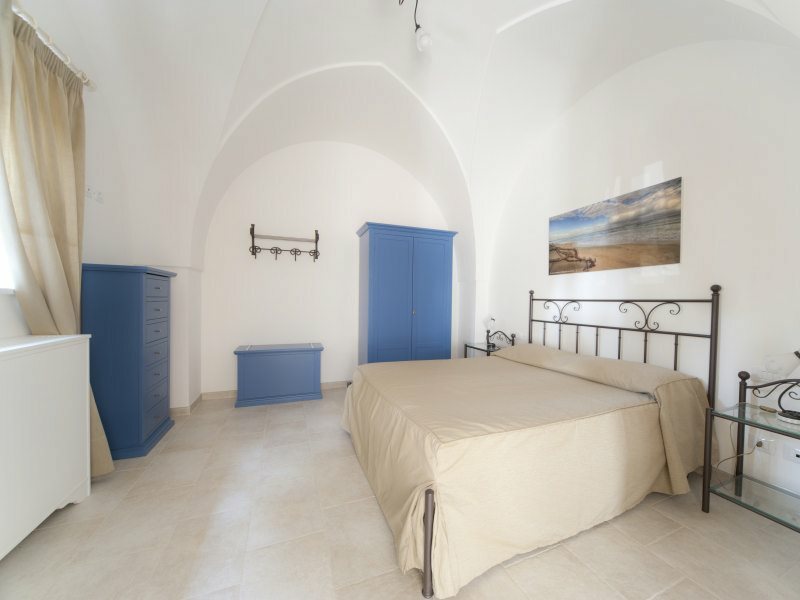 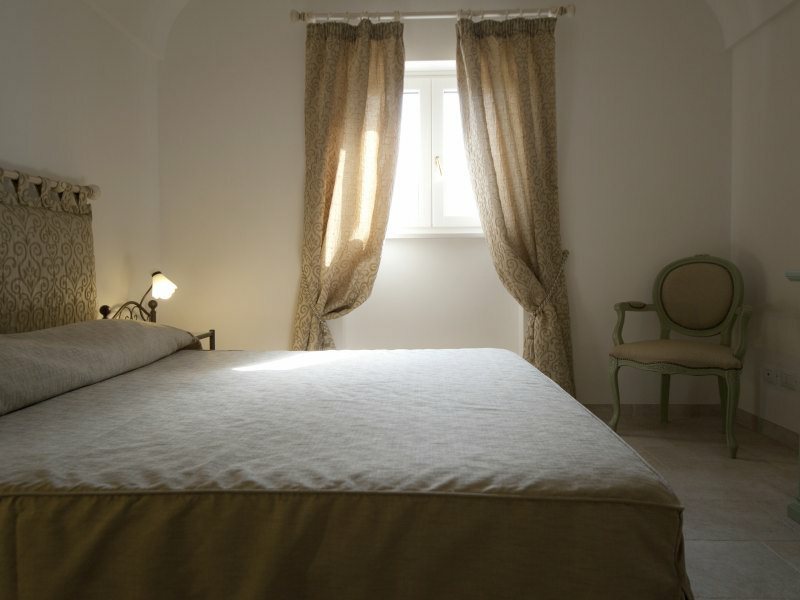 It's definitely the most attractive suite of Masseria, consisting of two very spacious: living area with kitchen, sofa bed, loft bedroom hidden by a sheercurtain, bathroom with shower; master bedroom with a beautiful canopy bed, window and private bathroom with shower. 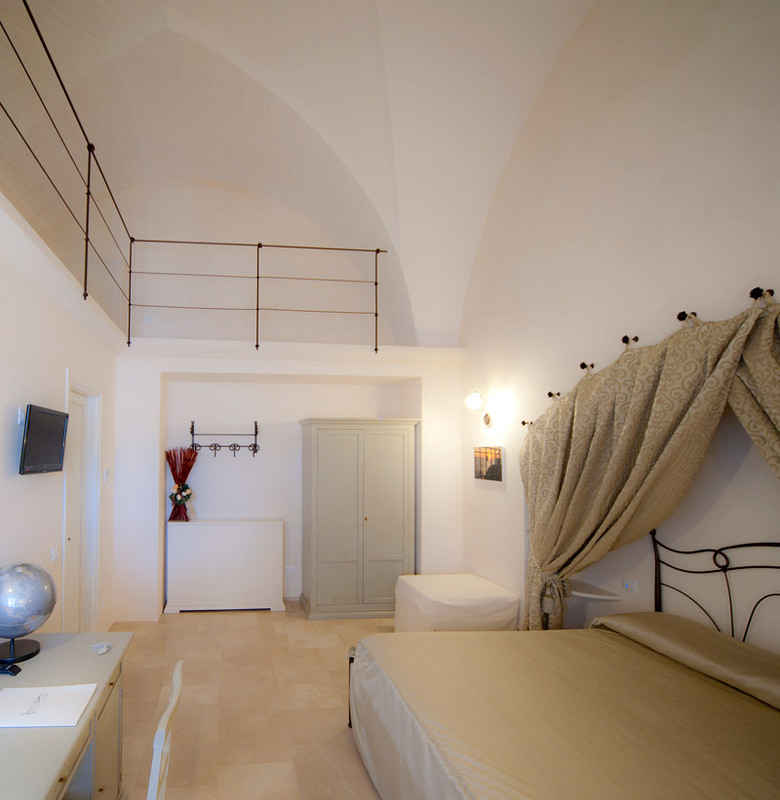 This suite is easy and comfortable, composed of a bright living area with fully equipped kitchenette, double sofa bed and bathroom without shower, large sleeping area with kingbed, gallery with single bed, bathroom with shower. 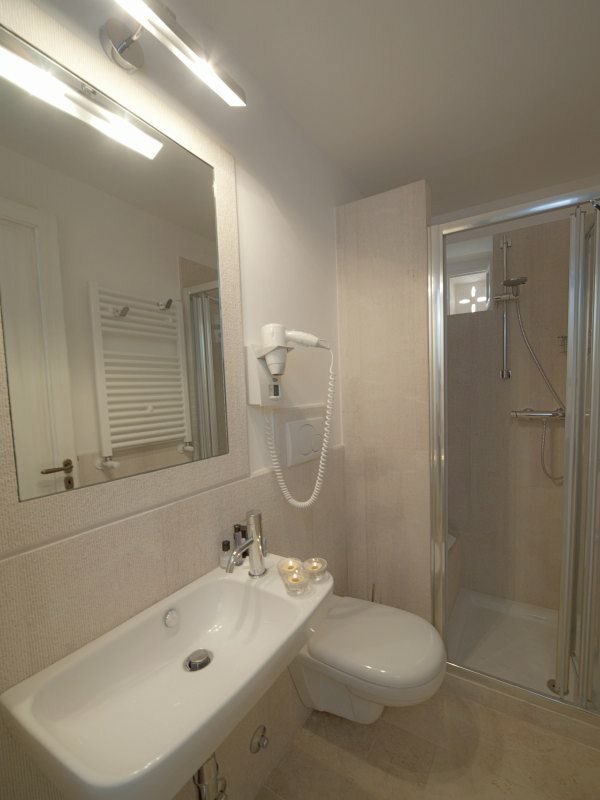 This Suite is one of the largest. 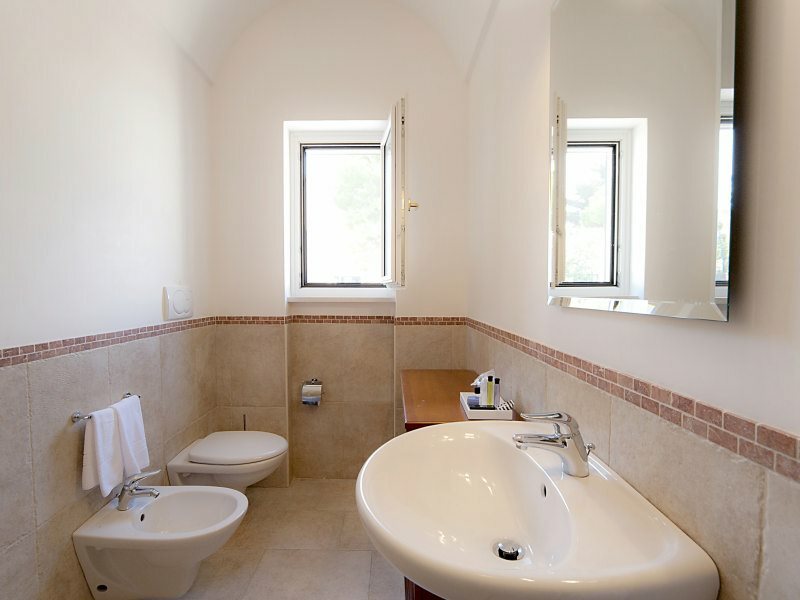 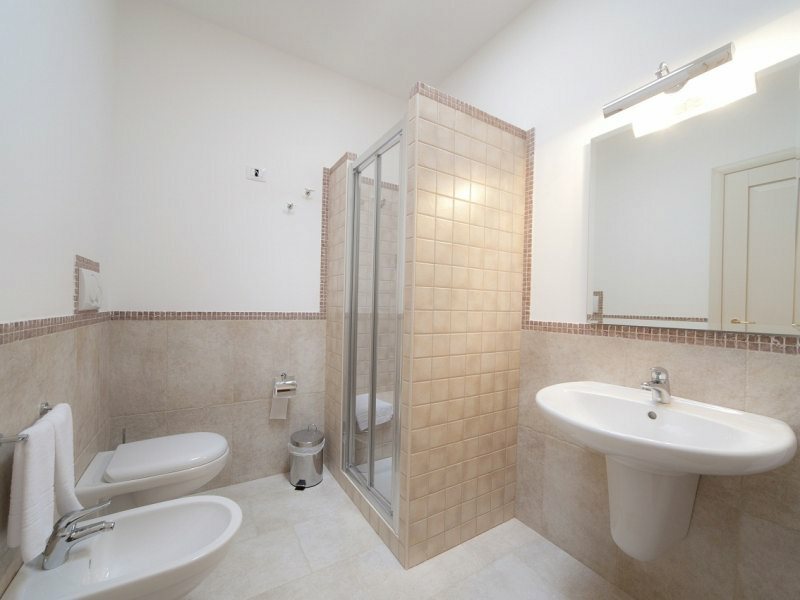 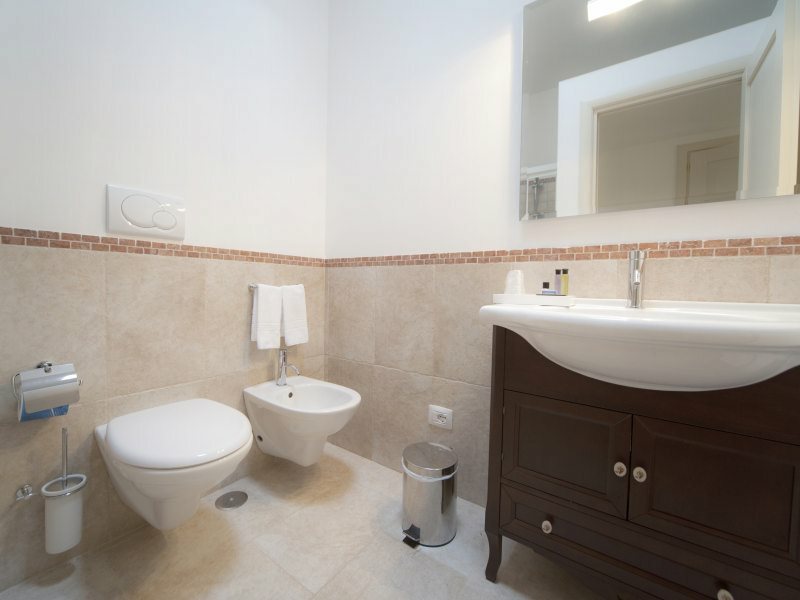 It has two bed rooms with private bathrooms and independent access. 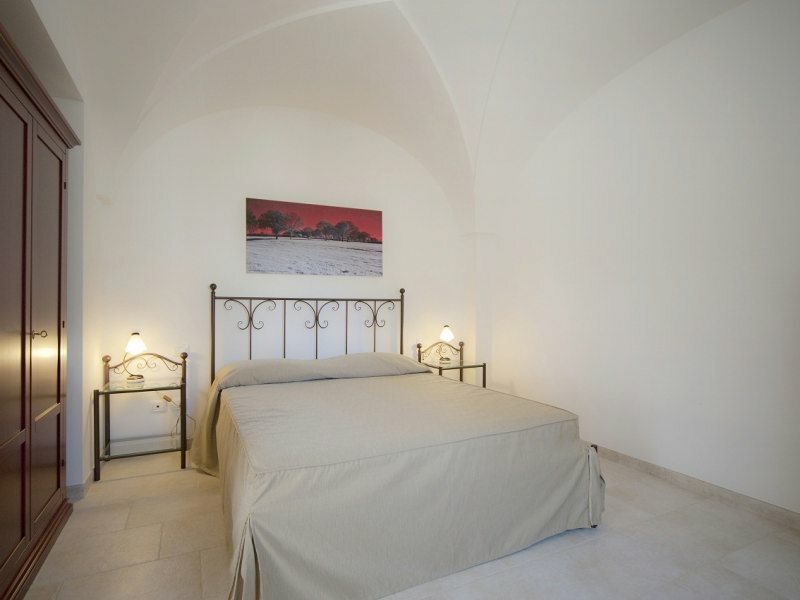 It is decorated in a refined style and consists of a living area with a shared American kitchen and double sofa bed, two bedrooms, one with a canopy bed and possibility of including a pouf bed and the other with a French bed, both with its own private bathroom with shower and sitting stone. 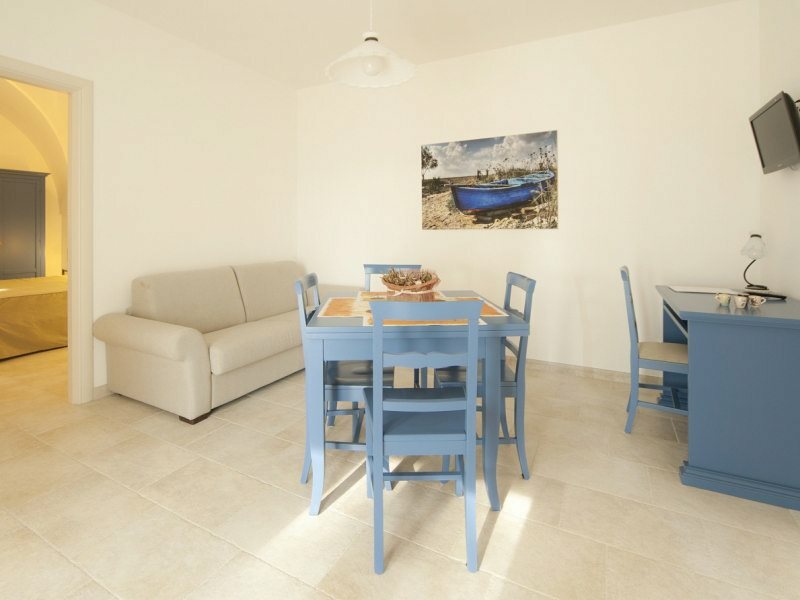 The apartment Sofia is the only one of the five apartments having a patio. 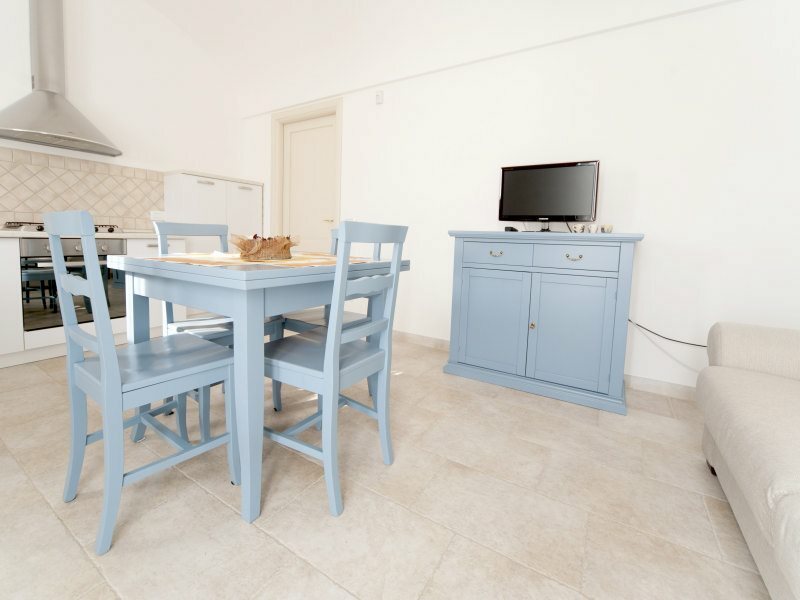 Decorated in shades of blue, consists of living room with sofa bed, fully equipped kitchenette with a handy snack area, bedroom with double bed, bathroom with shower. 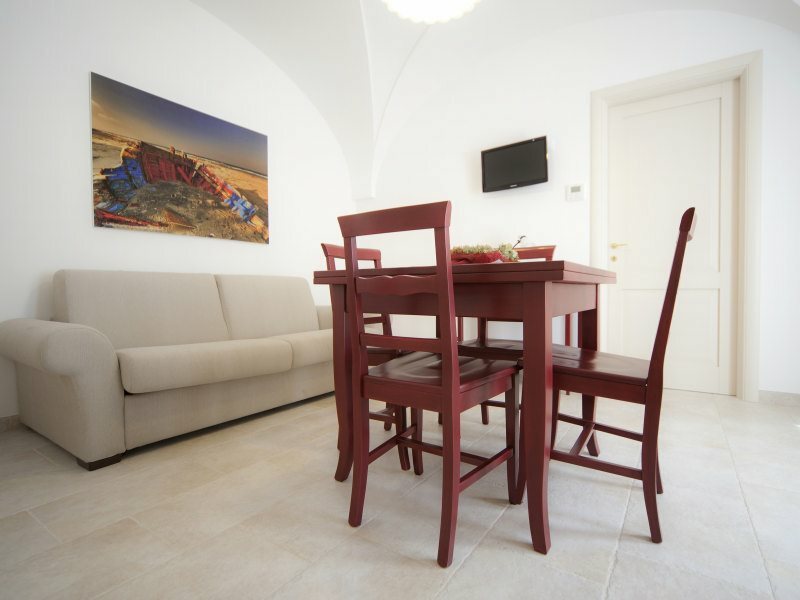 The apartment Vittoria, decorated in shades of red, consists of a comfortable living room with sofa bed, kitchenette with snack area, bathroom with shower and double bedroom. 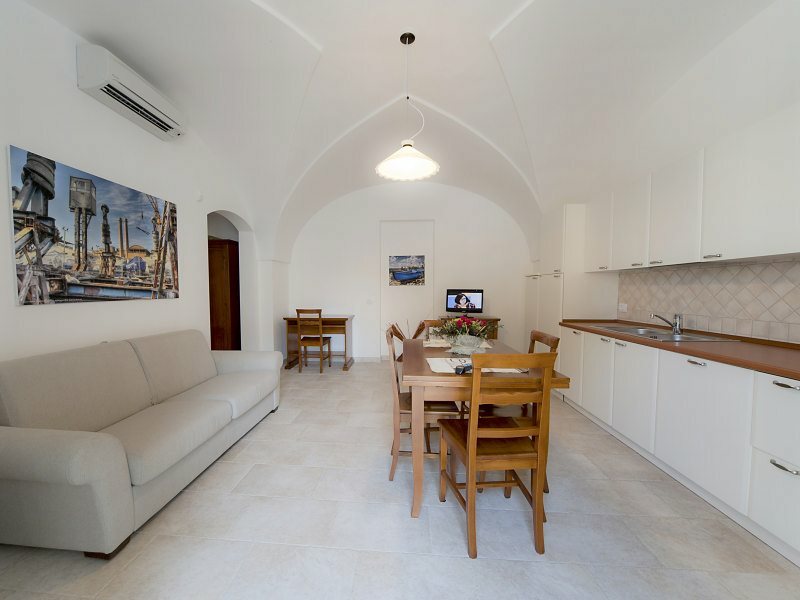 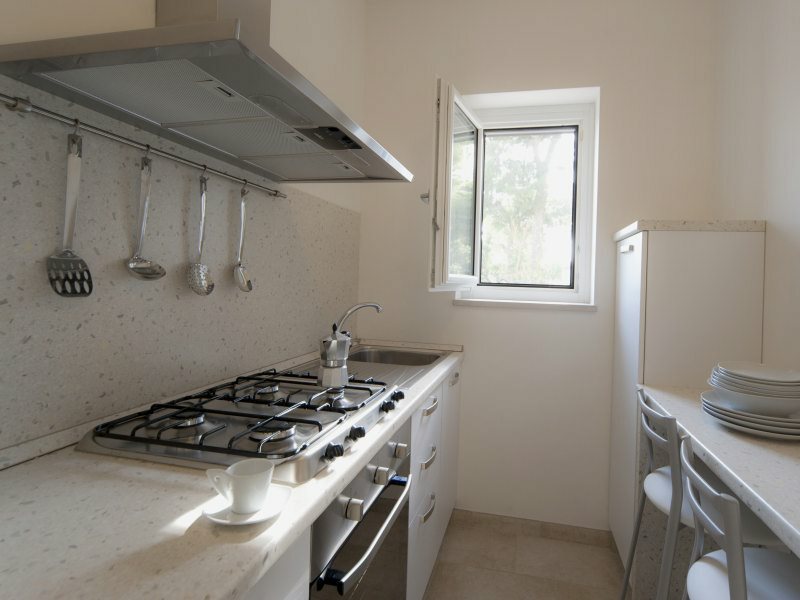 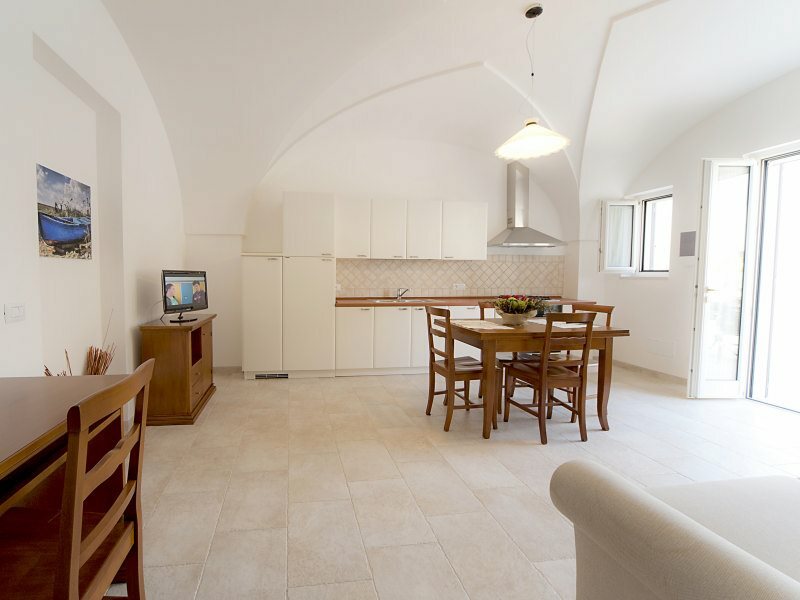 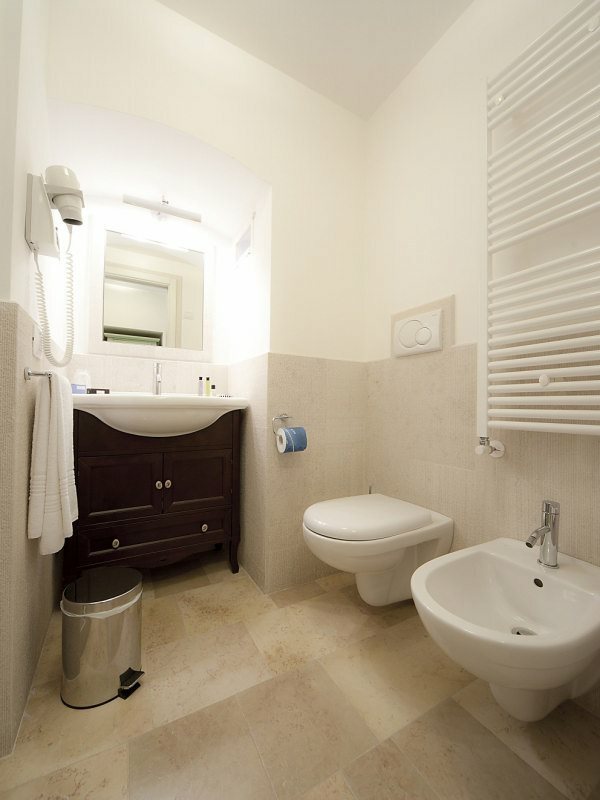 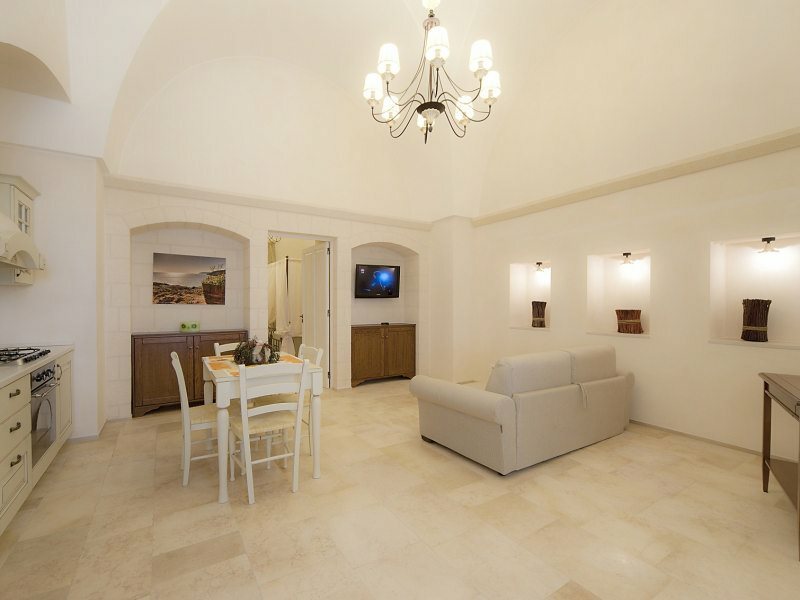 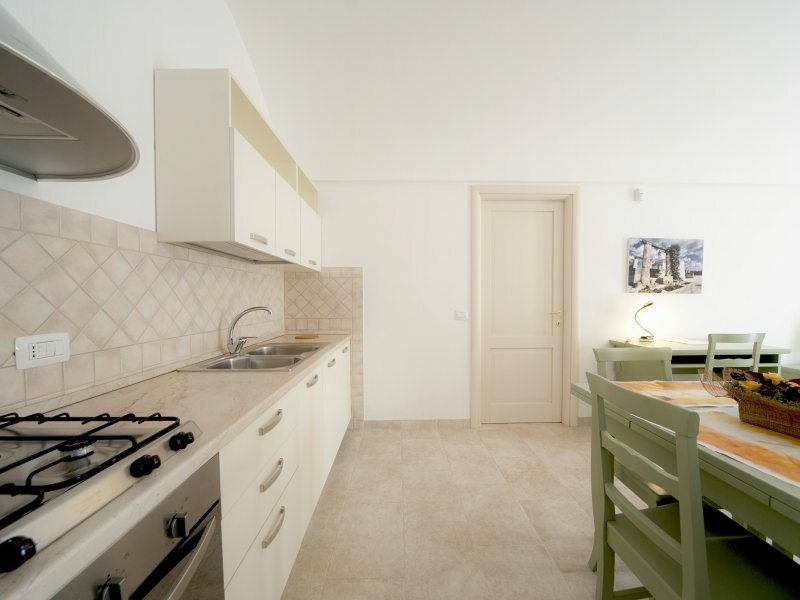 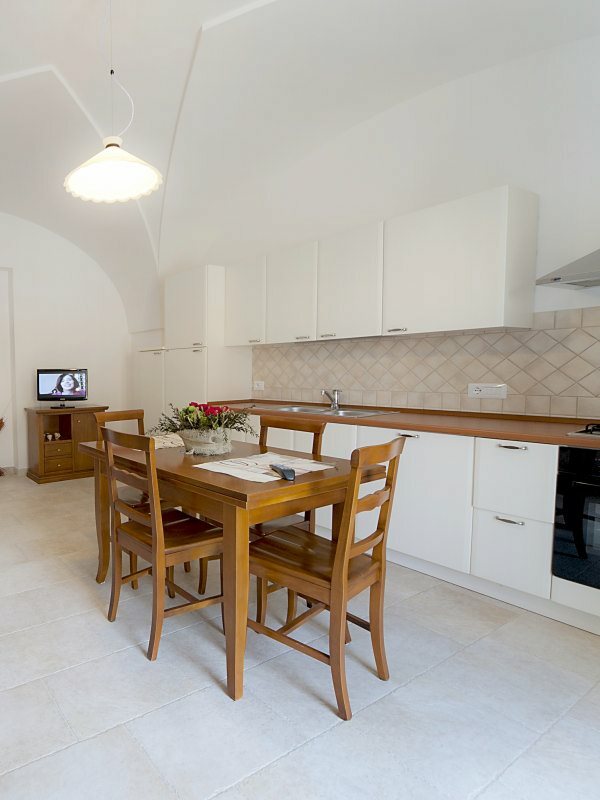 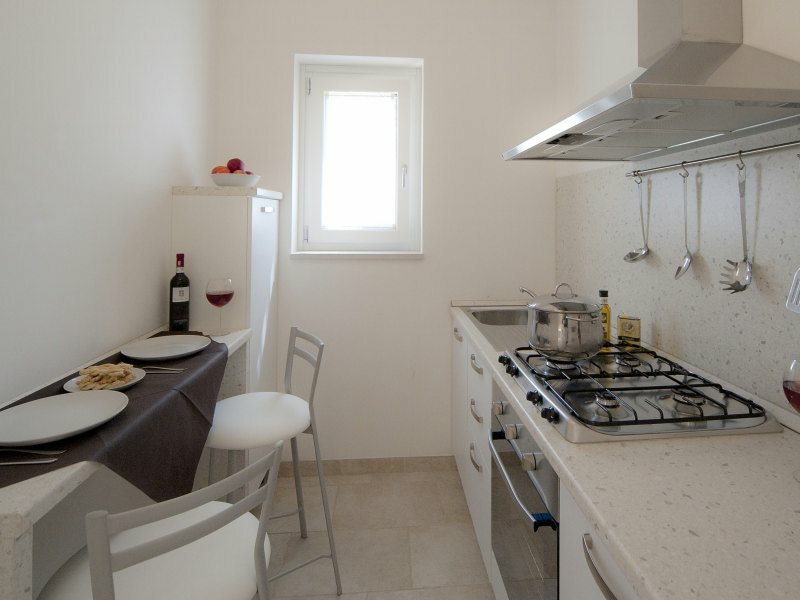 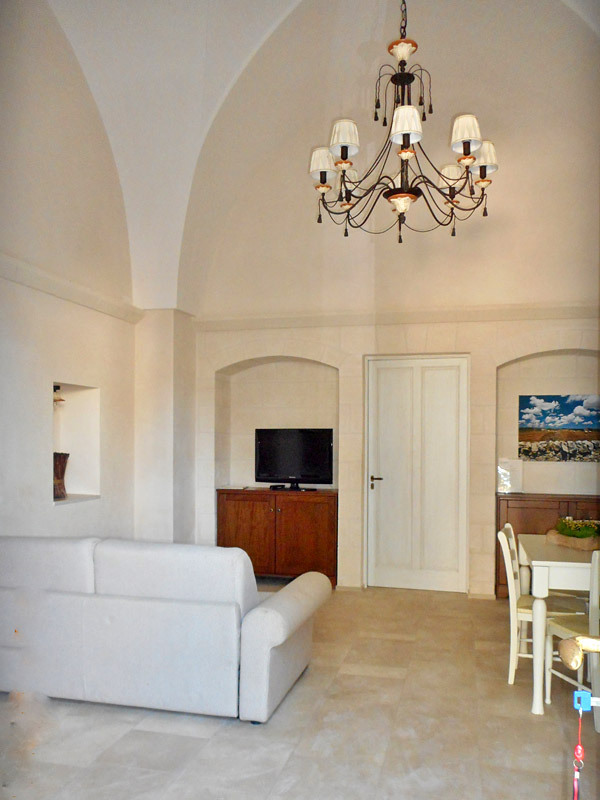 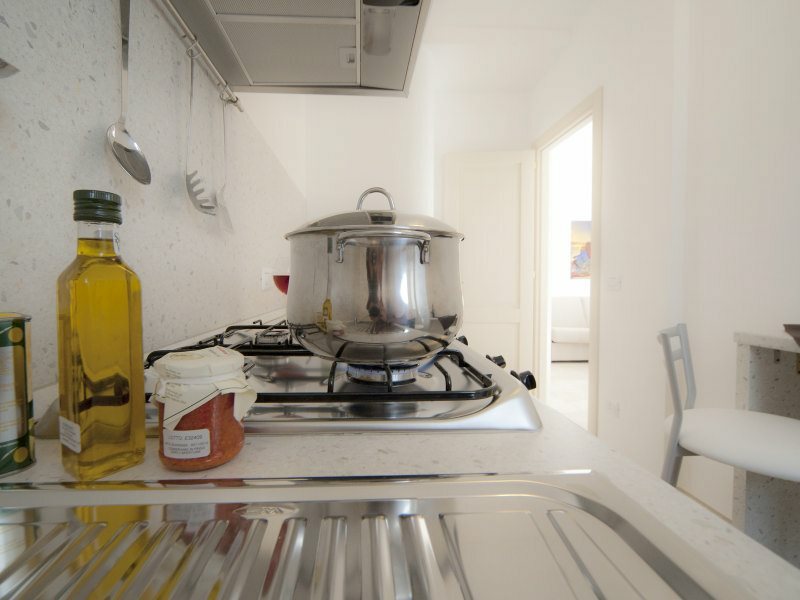 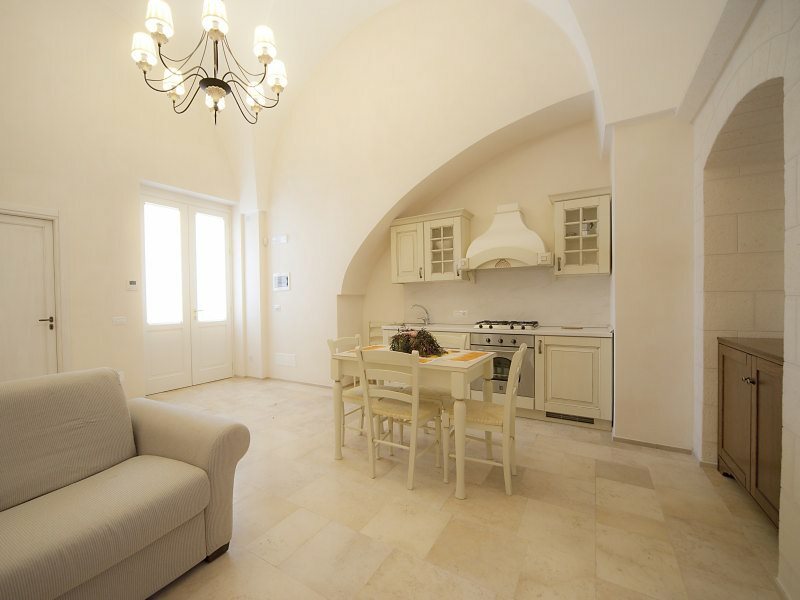 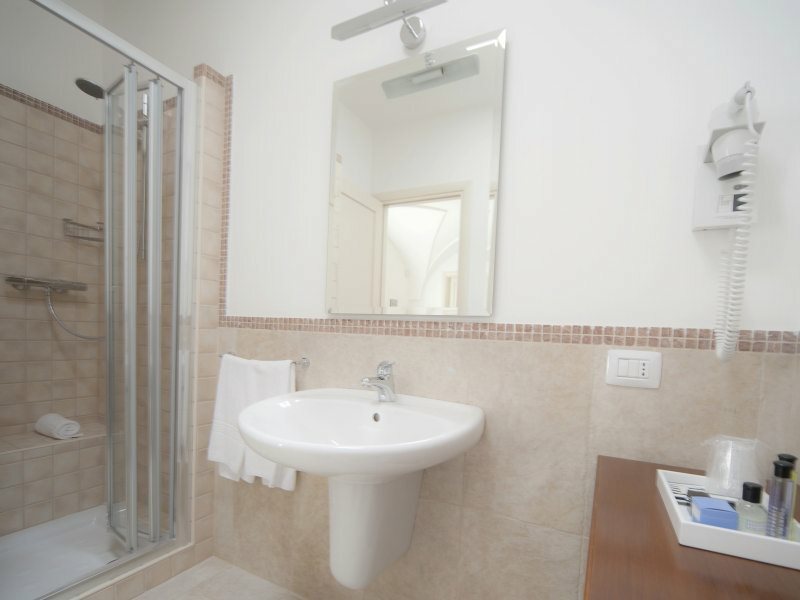 The apartment Margherita is the largest apartment available and can accommodate up to a maximum of five people. 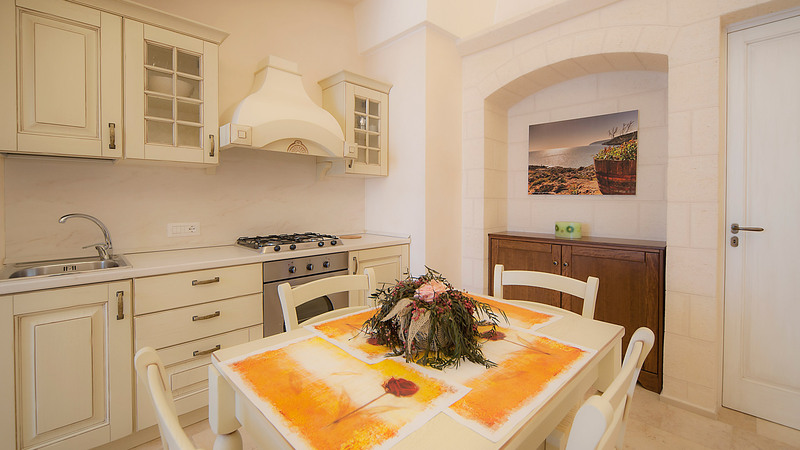 Decorated in warm wood tones, consists of large living room with an open kitchen with a refrigerator top, freezer and dishwasher, double sofa bed, bathroom with shower. 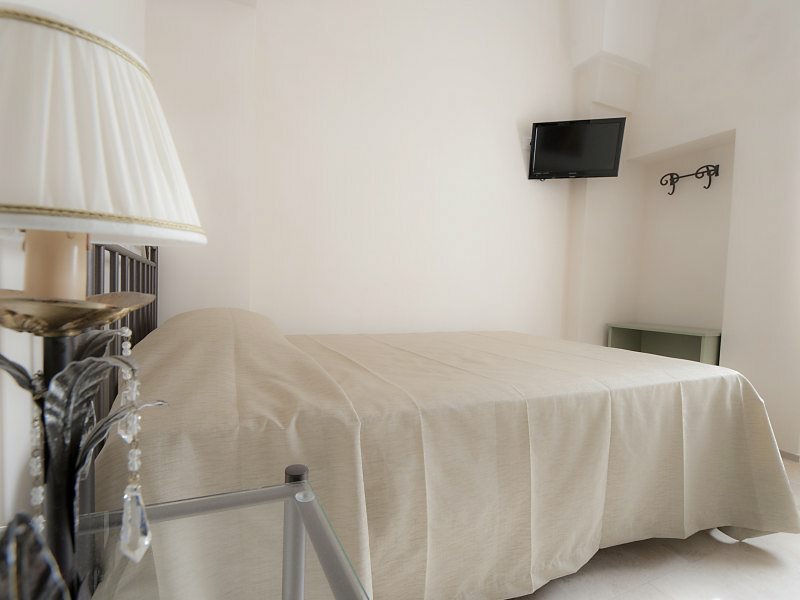 The room has a double bed and a single sofa bed. 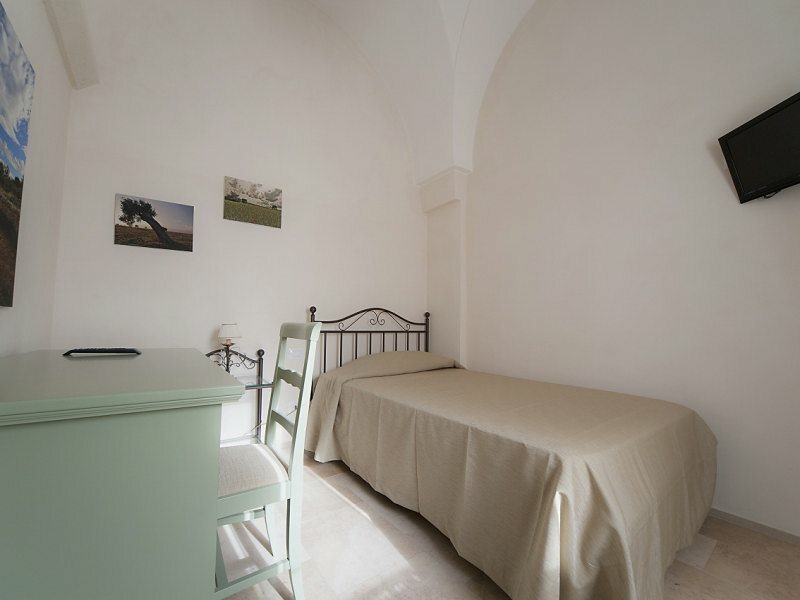 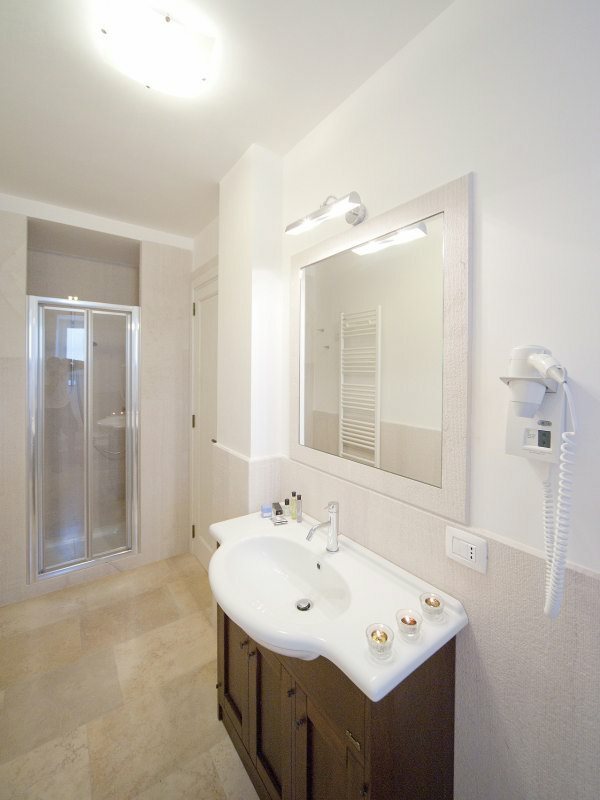 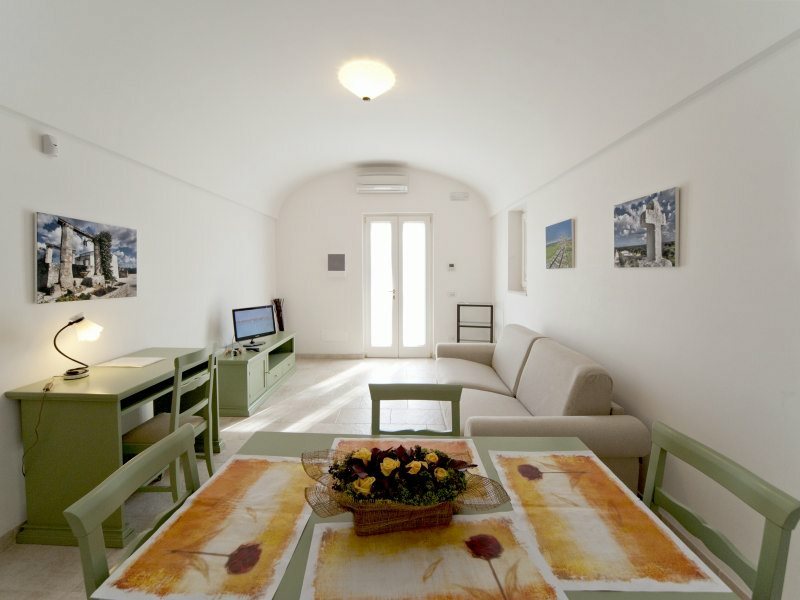 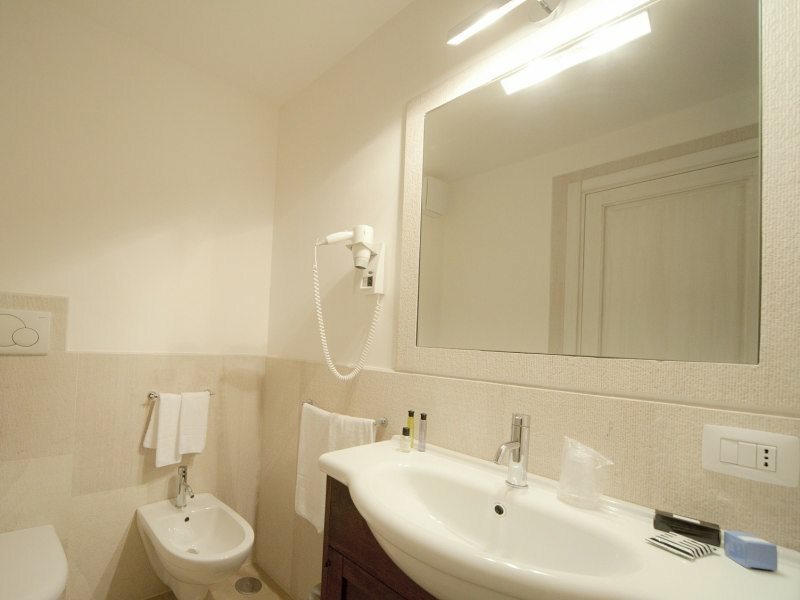 The apartment Elisabetta is that an gled more lighted, decorated in shades of green, and consists of living room with kitchenette, double sofa bed, bathroom with shower, double bedroom. 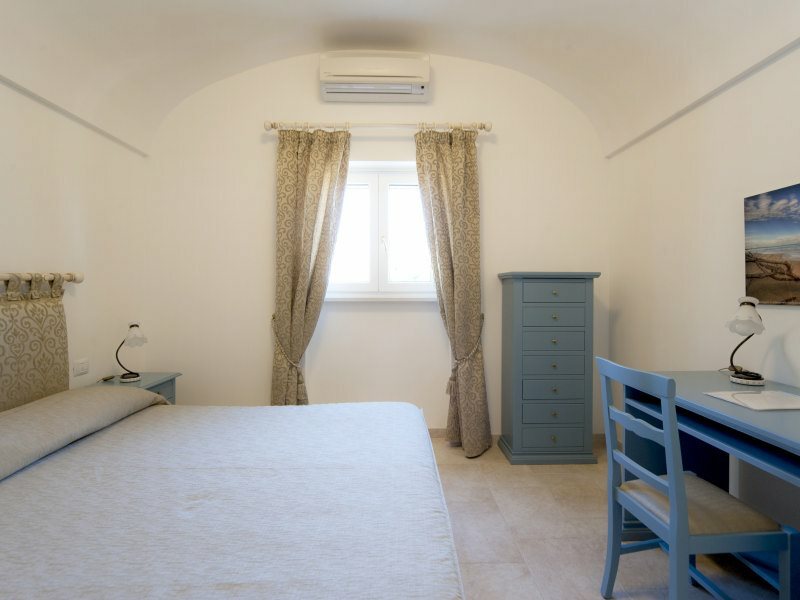 The apartment Beatrice, decorated in shades of blue and placed in a reserved position, is composed of living room with kitchenette, double sofa bed, bathroom with shower and bedroom.